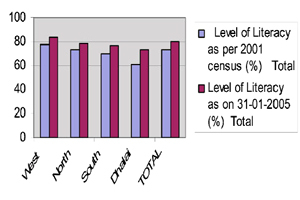 As per Census 2001, literacy rate of the State is 73.20% against National rate 65.38%. Male literacy rate of the State is 81.00% (National rate 75.85%) and female literacy rate of State 64.9% (National rate 54.16%). Zilla Saksharata Samities has forwarded position of literacy as communicated by the Sociological Resource unit of the Indian Statistical Institute (as on January 2005) vide his letter dated 31-05-2006.